Cubic Zirconia is Not the Same as Diamond. Are you Considering a CZ vs diamond as your “Gem” of choice for getting married? Is cubic zirconia on your radar for your engagement ring? You’d save a lot of money…. Do I approve? No! 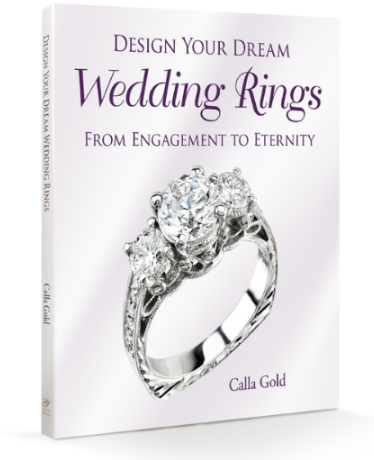 As a passionate wedding jewelry designer I’ll tell you why in technical and emotional terms. First I’ll talk about CZ’s and how to tell CZ from Diamond and then I’ll answer the questions that have come in the comments. Cubic zirconia—commonly called CZ—is widely used as an inexpensive diamond substitute. To the untrained eye, a brand new CZ looks like a real diamond. This is why many people substitute them for the real thing. Hey Cool a Skull Made of CZ. But I’m Not Using it in My Wedding Ring! Does this mean it’s alright to put one in your wedding ring? For a number of reasons, the answer is NO! A CZ is to diamond what brass is to gold. The two substances may look similar—especially when new and clean—but they’re not! 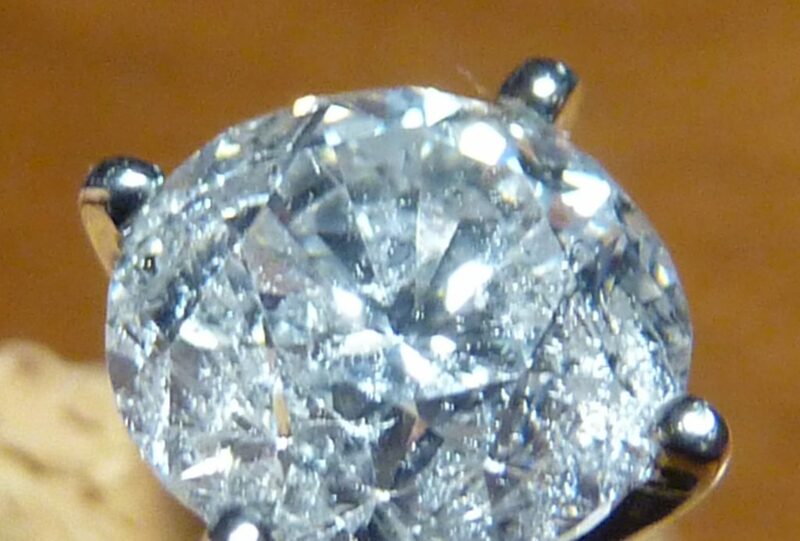 Unlike diamonds, CZ’s scratch and become dull and lifeless over the long term. They don’t sparkle like real diamonds either once you’ve worn them for a bit. Note the Out of Focus Looking Ring Around the Flat Table of This CZ. That is worn away CZ material. They Don’t Hold up. Technically, cubic zirconia is zirconium dioxide. It’s a relatively hard synthetic mineral. It’s optically flawless, usually colorless, though it can be made in a variety of colors. Don’t confuse cubic zirconia with zircon. The latter is a real gemstone. CZ’s are not. CZ’s are grown in a lab. We December babies who have zircon as a birthstone are not happy! 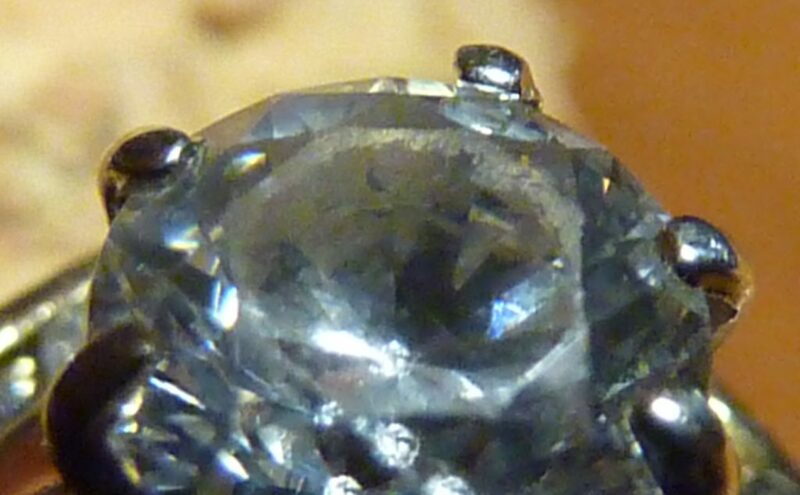 Notice the Clear Sharp Edges of the Table, (center flat part of diamond) of This Older Cut, Thirty Year Old Diamond. They do Hold up. 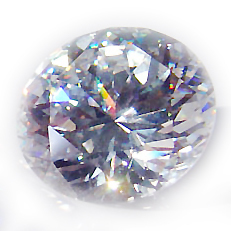 Many of today’s CZ stones have ‘softer’ facets than diamonds. Hold the stone in question next to a diamond and “huff” on them with your hot breath. Both stones will fog up. The diamond will clear up rapidly, while a CZ will take a little longer. This is due to diamond’s greater thermal conductivity. Because of the different make up of diamonds on CZ, one way to tell them apart quickly when they are unset is to try to read through them. I don’t recommend this. When I get a bunch of small diamonds in, I scrape each one on a piece of sandpaper. Once in a while one shows the scratch. Then I get out my diamond tester. Bing, red zone, that is not a real diamond. Sometimes on tiny stones a CZ slips in. Well it’s not going to make it into my jewelry. The scratch test is faster for me that using my electronic diamond tester. I Couldn’t Believe the Ridiculous Prices Online for CZ! Perusing the internet the other day, I was astounded at the prices jewelers—and the regular public—were quoting for CZ’s. I saw them costing anywhere from forty dollars per carat to hundreds! 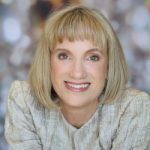 One site said that CZ’s cost about one-tenth of what a diamond does! That means that if a one carat diamond went for $6,000, a CZ of the same size would cost $600. Nothing could be farther from the truth! If you paid more than $20 or $30 for one—whatever the size—you probably paid too much. 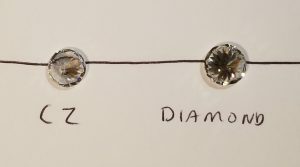 Diamonds vs. CZ’s, What Are You Saying with Your Gem Choice? Diamonds are the hardest natural substance on Earth. As I mentioned, they rarely scratch, they don’t cloud up, and degrade over time. 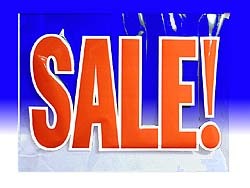 Like the famous slogan says, “A diamond is forever.” A cubic zirconia? Not even close. Diamond rings mean something. They’re a symbol of love, marriage, and eternity. Diamonds don’t degrade over time and the rings in which they’re set get passed down from generation to generation. CZ rings? Not so much. Diamond rings are valuable. CZ rings? Nope! CZ’s are cheap. A few grande lattes at Starbucks would cost more. So would a toaster or two tickets to the movies and snacks for you and your significant other. Diamonds are valuable. They’re important and precious. They always have been and always will be. Diamonds stand for a lasting, sparkling love. CZ’s…not so much. What a CZ Worn Daily Looks Like. This Ring Was Worn for Five Years. Technically, it would be cheaper to buy a new cubic zirconia once a year for many years than it would be to buy a diamond, but there are other costs to consider. If your intention is to replace your CZ every time the shine fades, then you need to remember to factor in the cost of labor to un-set the old and re-set a new CZ. While we’re at it, just like twisting a paperclip back and forth will break it, your ring prongs will not put up with your yearly back and forth un-setting and re-setting action without needing replacement. The labor and replacement, with prong work, may over time still be cheaper than having a diamond, but at what cost to your ring? Quite a bit if you stay married very long. Which I sincerely hope you do. 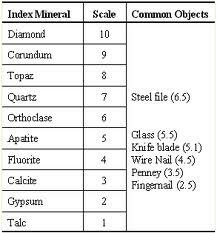 The Moh’s scale of hardness is not a numerical scale. A number is assigned to the next hardest gemstone in this scale. 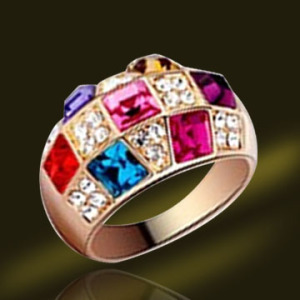 This would be a gemstone that can scratch the previous gemstone. That doesn’t mean that the next level of hardness is for example 10% harder than the previous gemstone. It could be 100% harder or it could be 13% harder. For example, the difference between a sapphire, which is 9, (corundum on the scale) and a diamond, which is 10 is considerable. A sapphire will chip and scratch way before a diamond will and yet they are one numeric level of hardness away from each other on the scale. A diamond is much harder than sapphire. So a CZ, which is at 8.5 is not close in hardness at all to a diamond. There is a very large gulf between the 8.5 on the Mohs scale of hardness of CZ and the 10 of diamond. CZ’s in Many Colors for Your Right Hand. You would never buy a brass or aluminum wedding ring, right? You’d get one made out of gold or platinum. Gold and platinum are valuable. Brass and aluminum are not. Brass is for plumbing fixtures and aluminum is for cheap pots and pans. Likewise, diamonds are for weddings. CZ’s are for cocktail parties. There’s nothing wrong with CZ’s in costume and less expensive jewelry—especially the kind your teenage daughter wears to school everyday (more than likely, on more body parts than you would care to think about). When it comes to matrimony, however, stick with the real thing. Choose a diamond. 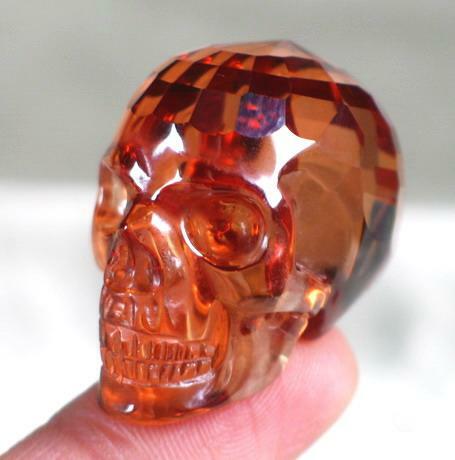 I think that orange cz skull is so cool too, but I’m with you, diamonds for wedding rings, not cz! I love the passion in your voice Calla! I love the idea of alternative stones for wedding/engagement rings, but the truth is, you want a ring that will last a lifetime, that you can wear through daily life without the worry of stone’s safety. Your comparison between Diamonds and Cubic Zirconia clearly defined the BIG differences. I knew diamonds were better, but in a vague way. Now I have the facts about diamonds vs cz and it’s good to know. I look forward to the day when I can upgrade my diamond with you! Oh…and YOU are a STAR Emcee! Great job this weekend as emcee for the Santa Barbara Business Expo!! Great Blog! This post was Informative and Well Written! 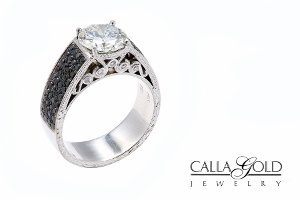 We do sell CZ and this was our introduction to Calla Gold Jewelry. 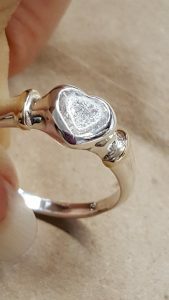 This is a great post… I’m glad you shared it as I was actually looking into CZ for my own wedding ring… after realising the difference I think diamond is the only way to go! It is amazing how much money people waste on CZ rings. There are women who pay almost as much as a diamond. Some people think its the smarter choice in terms of money but its not because a diamond lasts forever. Unfortunately, Cubic Zirconia IS a crystal similar to Diamond (diamond Cubic). I consider most of your points emotional. The scratches, degradation of luster are to be proven. Simply we want to appreciate Diamond because it is naturally occurring. Wouldn’t it be *substantially* cheaper to replace a CZ every few years than get a diamond? Diamonds aren’t rare — the high price is just the result of corporate monopoly and the emotional attachment is due to a very successful 20th century ad campaign from the men at Madison Avenue. Diamonds may have more sparkle, but optically are much more flawed. Wow what anger at how others chose to spend their money. One argument you omit is that there is no such thing as a “blood CZ”. Rings are symbolic gesture and as such their symbolism and the sincerity behind their giving is far more significant than anything else. Lastly diamonds are valuable purely because we say so. “Diamonds may be a girls best friend” but frankly that is the kind of girl that the world could do without.